We the Indigenous People of Biafra note with dismay the recent statement credited to the Information Minister of Nigeria Alhaji Lai Muhammad against IPOB to the effect and we quote, " The Federal Government has accused the Indigenous People of Biafra ( IPOB ) of using fake videos of mass killings, harvested from other parts of Africa and doctored to look current, to mislead the international community and win their support", reported in the Nation newspaper publication of 3 February 2018. What this statement confirms, apart from the laughably outlandish utterances of Lai Mohammed, is that IPOB remains exceptionally potent and formidable before it's enemies. 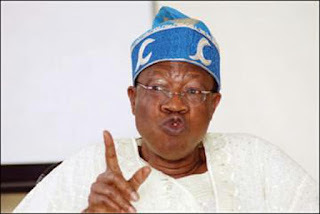 This fallacious and baseless concoction against IPOB, the most peaceful freedom fighting organisation in the world today, confirms what we have always known, that Nigeria and Lai Mohammed's Ministry of Information have lost the media battle against IPOB despite spending millions of Dollars to buy the conscience of local and international journalists. The world is belatedly beginning to ask pertinent questions, which the lying machine that is the Ministry of Information led by Lai Mohammed can no longer cover, hence this unguarded outburst against an honest movement. The false narrative that IPOB has been defeated, peddled by Aso Rock and their local agents in the South East and South South has been comprehensively demolished. What Nigeria is witnessing now is a tip of the iceberg because the main avalanche is coming, by the end of which every civilised nation will completely ostracise and isolate Nigeria for the savage outcast they have become. There is no video footage or photograph issued by IPOB that is false, absolutely none. We challenge Lai Mohammed to issue their own video clips of Operation Python Dance and the military invasion of the home of our leader Mazi Nnamdi Kanu on the 13th and 14th of September 2017. The commander of the raid boasted on live television during an interview that he watched the whole assault on Kanu's compound live on his monitor at Mission Control room of their field headquarters in Ohafia barracks. We challenge Lai Mohammed to release that very footage the Nigerian Army was referring to. It will confirm everything IPOB is saying to be correct and unquestionable. Lai Mohammed must know that all IPOB events are covered and streamed live on social media. So the world always have the benefit of watching unprovoked brutal military crackdowns and genocide in real time. Rather than trying to bribe, lie and intimidate his way out of the mess the Buhari regime is in, he should start preparing for his legal defence because very shortly ICC will require his presence in a proper court of law to answer for their atrocities and crimes against humanity. IPOB has been a transparent, peaceful and truthful organisation from the onset, with its foundation anchored on truth and nothing but the truth. That is why the international community believe us more than they will ever believe the discredited lying government Lai Mohammed represents. The only thing still delaying the inevitable implosion of Nigeria is Britain, international diplomatic niceties and non-interference protocols of the United Nations. But all these stumbling blocks are being eroded away on a daily basis. Britain will not always be around to support the status quo because as a civilised country, they too have their limit for tolerance of evil. Evidence abounds of Nigerian Army and Police invasion of National High School Aba on 9th February 2016, 30th of May 2016 massacre at Nkpor in Anambra State, 20th January 2017 slaughter at Igweocha Rivers State during President Trump Solidarity Rally and recent invasion of our leader's compound between the 10th and 14th September last year in Afaraukwu Ibeku Umuahia Abia State. All the videos and pictures are available for Lai Mohammed personal viewing. We shall be reissuing all the videos and pictures of the atrocities committed against IPOB by the Nigerian state for mankind to judge whether they are fake or authentic. It is now crystal clear to all sundry that Lai Muhammad will forever remain incapable of telling the truth even if he depended on it. We are also aware that Nigerian Government under the guidance of Lai Muhammed are actively recruiting unscrupulous individuals and groups to wage an online media campaign against IPOB which is doomed to fail. An organisation with recognised presence and footprint in over 100 countries and territories around the world cannot be defeated by brute force or cheap propaganda. We are here to stay until Biafra is fully restored as an independent state under God.